Welcome to our new column, The Editorialist NY, helmed by frequent contributor, LA native, and New York transplant, Lindsay Schapiro. From food to music, our new column will explore the other coast and everything it *supposedly* has to offer. The rivalry is real. See it unfold on The Editorialist NY. Greetings from the other coast! After a lot of talk and no action, we’ve decided to dive right in and bring you our brand new column “The Editorialist New York." From time to time we will check in with Lindsay, our LA-Native- NY-transplant contributor, to see what thoughts she may have on everything “the other city” has to offer. Now loyal Los Angelenos, make no mistake – the rivalry cuts deep and is here to stay. $1 Tacos vs. $1 Pizza, Bad Bagels vs. Pricey Produce, Terrible Traffic vs. Wicked Winters…. you get the point (Editor's Note: LA always wins). But a little friendly competition never hurt anybody, right? Besides, even California couch potatoes may choose to take a trip to the sister city every once in a while. When you do, we hope to provide some valuable insight into what to do and where to do it. Every New York resident has their go-to Pizza spot. Finding your holy cheese slice is a right of passage in this city. However, we often forget it’s not always easy to find that perfect slice for those with dietary constrictions and/or health issues. The same slice that leaves me nursing a greasy mouth and guilty conscience can have larger consequences for someone else. Enter Wild: the gluten-free/organic/hormone-free pizza staple saving the city one celiac at a time. Founded by serial social-entrepreneur Miki Agrawal (of THINX underwear fame), the restaurant promises a tasty offering of gluten-free pizzas and extensive menu of appetizers, entrees and deserts to go with it. Having been to the Williamsburg location, I can say it lives up to that promise. Cut to July 4th weekend; Marissa was in town and I was showing her around my neighborhood. While we strolled down 5th avenue (in Brooklyn), we stumbled on a new restaurant in its final days of construction. With an open design, white-brick walls, and minimal décor, Marissa was (of course) drawn like a moth to a Diptyque flame. I was thrilled to discover that, little to my knowledge, Wild Brooklyn has expanded south to the family-friendly haven known as Park Slope. The first franchise location of Wild, the Park Slope restaurant boasts the same tasty/health-conscious menu and a similarly ambitious millennial owner looking to make her mark. 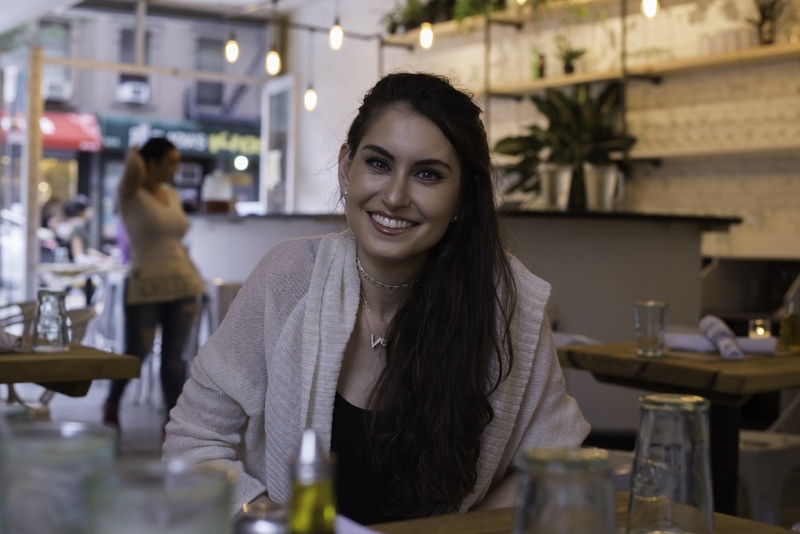 After years working in literary PR, Marina Charny decided to ditch the media business and dive head-first into the competitive New York culinary scene. She reached out blindly to Miki about the idea of starting a franchise of Wild and much to her surprise, Miki accepted. When the restaurant opened, I excitedly stepped in for a Saturday night dinner with the memory of dining at the Williamsburg location in mind. The fully-finished atmosphere is perfect for a summer evening in Park Slope. With sliding glass doors that are fully ajar, the restaurant is filled with a soft light that blends seamlessly into the white-bricked walls. Tasteful indoor plants and rustic light fixtures make it feel like a little part of the great outdoors has come to Brooklyn. The staff was quick to seat us and refresh our memory as to what Wild’s food is all about. After glancing over an array of farm-fresh starters like the Gluten Free Nachos, Fresh Hummus and Fig Salad, we opted to start with the more traditional route of the Kale Caesar. The salad was hearty and tasty with a Caesar dressing that was the perfect blend between light and creamy. Next, we glanced over the Pizza options, which included everything from Spinach Artichoke to Spicy Prosciutto. After debating between the Wild White and the Wild Mushroom Truffle, we decided to go with the Truffle. 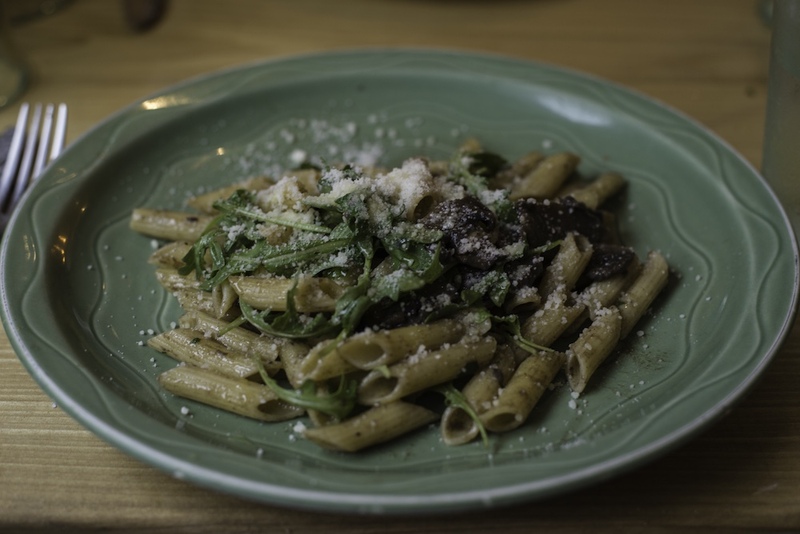 For the sake of consistency, we had the mushroom pasta with truffle oil for our entrée as well. The pasta was cooked al dente, as gluten free pastas should be, and was a very nice compliment to the “white, light, and truffle” theme of the evening. 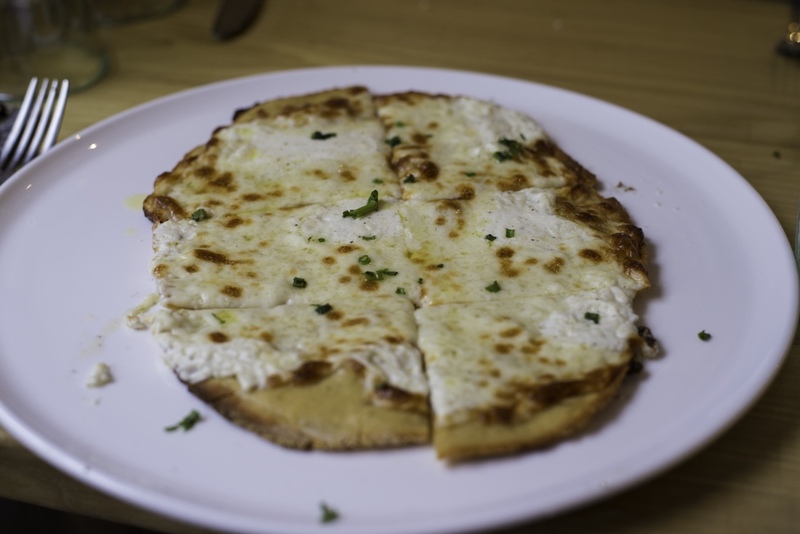 The pizza was your traditional flat-bread style pizza with fresh mozzarella cheese, wild mushroom, and the perfect amount of truffle oil glazed on top. The gluten-free thin crust was brick-oven crispy and very flavorful. The desert options were shown to us on a platter that included everything from flowerless chocolate cake to tiramisu. We opted for the strawberry cheesecake, which came with a crumble made from whole-grains and fresh seeds. For a chocolate fix, we had the raspberry chocolate cake with a richness in flavor that almost made forget how healthy it was. Overall, the food was delicious, the ambience was lovely and the staff were extremely attentive. I left feeling incredibly satiated, while not nearly as full as a more heavy Italian meal leave me. While I very much enjoyed my fresh-squeezed lemonade and coke from the bottle, I look forward to enjoying a glass of white wine with my next meal at Wild (once their liquor license comes in). If you’re in the neighborhood and are in want or need of a tasty yet healthy dinner option, look no further than Wild Park Slope. Your taste buds and your tummy will be happy you made the trip.